Leave your funniest clean caption in the comments section below. We reserve the right to delete captions that we deem inappropriate - so be clever, but keep it PG-13. Captions submitted any other way (smoke signal, carrier pigeon, feedback form, email, or otherwise) will not be accepted! Captions will be accepted from the moment this post goes live until Thursday, March 21st at 9 a.m. Mountain Time. The prize this time around is a (drum roll please) - pcDuino (and a pcDuino wireless dongle). If you're not familiar with the pcDuino, it is a high performance, cost effective mini-PC that runs full-featured operating systems such as Ubuntu and Android ICS. You can read more about it on the product page. Alright - ready, set, caption! May the best caption win! Dear Mom, It appears I'm moving up in the corporate ladder. They gave me a raise and I now have someone working under me. I also have an office with a view and I get to mingle with the higher ups. I do have to share my office with a co-worker so when you send cookies could you please add extra. I really wanted to enter this contest, but this one is just too good! Can't top it, can't be done. Wouldn't be prudent at this juncture. PC over Mac... as usual. Because your PC doesn't have a keyboard light! In Soviet Russia, shield stacks you! Breaking news: Sparkfun demonstrates it's new high performance dual core programmer; future plans include triple and quad programmer configurations, after they find a room with a higher ceiling. "Dude, there's an empty seat like right over there..." "No no no, those chairs kill my back." You know, the rules don't state that Employees are exempt from entering ! Not from entering, just from winning (except for sweet, sweet, internet fame). The next step beyond parallel programming: Perpendicular Programming? The IT group is testing the concept of vertical clustering. Me order! Me Master! Me run Sparkfuntown! There's so much more room for activities!!!! The other interns quickly learned not to ask for a desk with a view. The elusive Atomic Teabag, finally captured on film. "Naaaaate, he's doing it again!" "Well, it started out as a tiny bump on the back of my neck..."
Multi-level marketing I've heard of but multi-level engineering? Today was rough... my boss was really riding me. Dude, it's called a cubicle, not a squaricle. Ever since we've started stacking desks productivity has been at an all time high. The guys liked to sneak in some cheerleader practice whenever they could. It worked great, until the day they went for a curry at lunch time ! Full stack programmers -- accept no substitutes. Nate, this office overcrowding is getting ridiculous. When are we moving again? This is not what I had in mind when corprate said we were starting vertical integration. I thought he said we'd have a new hierarchy. Nested tables are simpler in HTML. Your logic is sound, keep up the good work! I'll code the high bytes and you code the low bytes. We'll show them how to make a stackable header! Introducing our new, more efficient Arduino shield inspired desks. Chairs sold separately. I think the boss said "pair" not "chair"! We've all heard of Quad-copters, but here's a rare look at the double-office-drone. Twice the work in a single cubicle, something Microsoft has been trying to design for decades. Well, that and a good operating system. To fully understand the stack, you must become one with the stack. With the success of stackable arduino shields, Sparkfun is pleased to release yet another new product, stackable office workers. In a recent cost saving measure, Sparkfun Corporation has begun outsourcing work to Munchkins from the land of Oz. Sparkfun Founder/CEO Nathan Seidle reports that the new cost saving measure will at least double the possible employee density at the Sparkfun offices. Taking split-screen to the next level. After all the experiments, this IS the best way to test the altitude sensors. Introducing the new Sparkfun Rastafarian shield! When they said bunk desks, I pictured something entirely different. Real Life Parallels Desktop: Run Windows on Your Mac! Yes, we know you guys were chicken fight champions at the Sparkfun pool party last summer. But seriously, give it a rest! Sparkfun employees are not looking forward to the addition of middle management. "Dear Sir, please find enclosed a photo of the water-damaged ceiling tile that we discussed on the phone this morning. As you can see, it detracts from the appearance of our office, and we would like to have it replaced soon." HR was out today... That about sums it up. Why do you get to be MSB again? Jake prefers Windows over OS X. This is how we do our two layer design work. The high ceilings in the new facility should allow for four layer designs. Everyone assumes they're programming. I'm pretty sure they are just checking facebook. Engineering thinking outside the box to come up with new ideas for Arduino stackable shields. Sparkfun Engineers double-up to meet Nate's new project deadline! You program the top shield and I'll program the Arduino. Taking extreme programming to the next level. So this is pair programming! Guy on top: I don't know about you but I am skipping lunch today. Guy on bottom: I just finished lunch. Let watch Scarface! Guy on top: Sweet, pass up the chips!!! I thought that Bill looked especially confused today. Too cheap to buy a hair dryer and tired of the stacked employee seating, Bob has managed to convince Human Resources that Tom "has some kind of bladder problem." Sparkfun Corporate Training, Lesson 25: Vertical Integration. Person 1: Hey dude how's the light up there? Person 2: just fine, how's the view down there ( laughing ) ? "Here in Sparkfun, we work cascading-ly"
Pair programming? Why not parallel programming? Arduino stacking design: you're doing it wrong. Day 12 of the longest piggy back ride... Someone get the World Record People. At SparkFun it is hard to find a good Wifi signal unless you know where to sit. Sparkfun: The only direction we know is UP! Somewhere along the way understanding high-level and low-level programming became obscured. Programming was way more efficient before they added the high level programmer! ...And that's how we could afford to do Free Day. "Stacking shields for Arduino has become really popular. What else do you think we can stack?" In an effort to reduce office space, we are introducing the double stacker seats. Life as a conjoined twin here at Sparkfun is a thrill-a-day. My brother has grown his hair out so people can tell us apart. "That's called adding a shield"
He put the team on his back doe....literally. "POOR GUYS IN INFO RACE - EITHER ON MY PIGGYBACK OR ON THE STAIRCASE OF YOUR WAIST!" The new interns quickly learn about loosing bets at SparkFun. Upper decking. Doing it wrong. Recently fired cirque Du Soleil acrobats in job retraining program. High cost of office space has lead to boom in micro-office rentals. Despite their handicap Siamese brothers Jim and Jeff, make a formidable programming team. Experiments in physical human parallel computing did not have the same net positive effects as for multi-core CPUs. Gives FIFO and LIFO a whole new meaning! Bunk desks have proven to be a great success. Now we just need some bunk chairs. I don't always stack things, but when I do, it's Sparkfun employees. The new definition of a double workload. Extreme Pair Programming is an agile software development technique, especially used in Extreme Programming methodologies, in which two programmers work together sharing the same chair. The configuration can include: side by side, bottom-up (pictured above) and back to back. Yo dawg. I heard you like multitasking, so I put a person and desk on a person and desk, so you could type while you type. The latest in dual monitor systems. Looks like Joe was promoted to tier 2 support. SparkFun developers test out new scaffolding support their MVC framework. Vertical scaling in the cloud...you're doing it wrong. INTRODUCING THE LATEST FROM SPARKFUN: The "Bunk-Mate" System! (patent pending) In an effort to improve efficiency, SparkFun is now letting employees LIVE at their desks 24/7. In this picture we see the new "Bunk-Mate" system, complete with stacked desks, a universal seating system, and food (see left) for employee convenience. This desk-apartment setup has a minimum capacity of two, and ceiling tiles can be removed if necessary. SparkFun: It's all about the customer. Its true... it does roll down hill. "Sparkfun's attempt at a piggyback world record was beginning to take its toll on the workers." Hey, I think Ive seen [this](http://en.wikipedia.org/wiki/Shutter_(2008_film) before! The code goes all downhill from here ! The new pick and place machines may be fast, but their practical jokes were getting out of hand. Looking back on things, the twins wish they would of had the surgery to separate them when they were infants. Welcome Folks it looks like we have us a Double Header today. Are you sure this is what Nate meant? Sparkfun's latest attempt to double their processing power. The assembly instructions from IKEA were a little confusing to follow. Nate told the new guys to double their efforts because they were not stacking up. John_Doe = new engineer(); ERROR, stack/heap overflow! The office ergonomics initiative took an odd turn when they hired the new guy unfortunately named "Ergo". We got where we are today by sitting on the shoulders of average-sized men. New Standing Desk initiative goes disastrously wrong as flat-pack instructions are mis-read. Sparkfuns attempt to get Performance Art into the Leanin' Tree. At Sparkfun, vertical integration takes on a more playful meaning. I said you two needed to program a PEAR package, not program pair stackage, what made you think I meant, oh forget it. When demand for programmers exceeds office space. The new Sparky Intern-pedic chairs. Its like working on a cloud. when they said they were doubling up on the work, I didn't think they meant it literally. a new level of pair programming has been pioneered at Sparkfun! Let me transfer you to our top tier support. Que hold music!! Stereoscopic programming, the next level. Hello World now in 3D! SOMEBODY made a mistake entering the Z-coordinate. It's kind of inappropriate for Scarface to put his head up a coworker's skirt. Who's idea was this job sharing? Somehow I think we missed something. My entry: "For God's sake take that picture down or they'll try doing that here!" If you think that's weird, you should check out the urinals. Best way to hide from aliens! They always abduct from the top down. We were given own cubicle before it comes to system integration. I mean this is how you connect an arduino to a shield. Sparkfun, a vertically integrated company. Parallel Processing... The next big thing they claimed. Who needs multi-tasking when you can multi-desk? Here at Spark fun we like to get inside the heads of our arduino shields. Taking shoulder surfing to a whole new level. OK, I admit it: the bunk desk does save a lot of space in the office and brings workplace camaraderie to a whole new level. I have serious doubts about the bunk toilet configuration planned for the first of next month, however. Next time order longer jumper wires! We've worked closely on many projects, and you? Who remembers Totem-pole logic gates? Aha! A bug in the upper register! The Sparkfun engineering department bench testing their new dual brain Cyborg Programming Unit. This is how to get a leg up at SparkFun! New 3D work space for our cubicles? I don't think that means what you think it means. the quote "Say hello to my little friend" had developed a whole new meaning. Sparkfun's new widget the Human-Duino. Who wants a top notch engineer? Embedded design? Tough career! Get a head start! Guys, that is not what I meant when I said to make sure you include a stackable header in the shield design! "Hey Rob, I think the new guys misunderstood when you told them to test the new 'Stackable Ethernet Shield'..."
have you found mordor? not yet! Jordan had an interesting way of emphasizing that they were programming a LIFO stack. Microsoft introduces new 3D desktop. Dude, one more and you'll blow right through the stack ceiling! Sparkfun hired an efficiency "expert"
"Sparkfun is always looking for new ways to reduce design footprints without reducing function." Product Description: The new XtraDude Shield slots on top of compatible existing Dudes to double processing and crank-turning capacity. Requires LumbarHeader 1.9 or later, not recommended for pair programming or on Taco Day. Joe....? Yes, John? I don't think this is how you do Pair Programming. Yeah, bro, could you give me a hand? I can't seem to get reception over here. In this economy, most companies are down sizing... However, here at Sparkfun we believe to best way to improve productivity is to increase overhead. Although this technique has proven effective, it occasionally results in neck strain and fatigue (we haven't been able to track down the reason for this yet). Shieldstravaganza! We weren't sure that we were going to feature this quirky shield, but these little guys can be stacked on almost anything. Sparkfun Product Development Team try to experience how to stacked Arduino shields mate to one another. Best method to enforce good posture for keyboard use at the office. The first attempt at paired programming, did not show a lot of promise. Who says Americans are bad at using vertical space? This is what happens when management rashly ends telecommuting. Don't say: double-decker. Say: double-desker. OK, I don't have as many people under me as I did when I cut grass at the grave yard, but this is a start. Sparkfun is proud to accommodate special needs employees: Mason and Jason, the Coding Siamese Twins. While Josh and Tony were totally into Agile development, they didn't fully understand the meaning of paired programming. Business is great, we had to double our work force just to keep up! And now you have two problems. I am happy that you are now bicycle commuting. But you know, we do have a shower. single layer coders is so 2012, double layer coders is the future! OR I had a bad moment trying to figure out how I was going to use my desk, but this has worked out very nicely. OR I was always cold but my coworkers wouldn't let me adjust the thermostat so I moved my desk up into warmer air. OR Forget about bunk beds, bunk Desks! OR There wasn't enough light where I was working before so I moved closer to the light. In a corporate move, Sparkfun is beginning to vertically integrate. You know when you sit on a chair, lean back on two legs, and you almost fall over but at the last second you catch yourself? Well, I feel like that all the time. How is it going with you? You think you could warn me when you are about to sneeze? Double the pleasure and double the fun, We work Twice as fast for the shoppers at Sparkfun. The end result of cancelling our work from home policy. In the rare event of lasting more than 4 hours, seek immediate medical help to avoid long-term injury. I'm glad you are not a giant, this light is getting warm. Why are we smiling? the boss is crazy, this ain't gonna work. Testing Sparkfuns New Hair Locking solar crystals called Dreads. (D) Doing (R) Real (E) Educated (A) And (D)Designed (S) SparkFuN Electronics I feel the light, DO you? The pressure of being number two! Ahh, ... I have to go. Again? Can't you hold it, I'm right in the middle of an interrupt! Dude, maybe you should cut down on those chips? I think you've gained a few. The real reason behind why we had to petition for extra footage in the new building...otherwise three people don't fit. Colorado passes tax cuts for companies that desk-pool. I didn't know rents per square foot were that high in the US. This is why I started working from home. The Co-Worker Shield, stack it on top of an employee to increase productivity! Excuse me, Um, I believe you have my stapler. Agile Development principles: Programmers working in pairs usually produce shorter programs, with better designs and fewer bugs, than programmers working alone. However, SparkFun developers forgot to read the part about "side by side"
The new sparkfun stackable programmers!!! When they said software stack, I had something else in mind. Hand me a bag of chips. Dude, at least you're on top. Whenever my conjoined twin gets out of line, I just forget to duck through doorways. Psst... Still no luck, huh? I didn't know Sugru was such tough stuff to remove! Good grief guys, I know we're in a vertical market, but this is getting ridiculous! So, we're playing Quake, right? And Seth is all like, "No, I'm not peeking at your screen." Two is better than one !!!! Q: How many software engineers does it take to screw in a light bulb? A: We don't know yet. We are two in and still haven't accomplished it. Some engineers go to great lengths to avoid admitting they might have a hardware problem. Try a standing desk. Your back will thank you for it. The new POE standard @Sparkfun: "Person Over Engineer"
"Say hello to my little friend!" - Epic teabag. In this country, you gotta make the money first. Then when you get the money, you get the power. Then when you get the power, then you get.... your own floor space for a desk and a chair. Human office shield 1.0 in development. Noah's pathological antlophobia (fear of floods) meshed neatly with Bob's combined astro/aerophobia (fear of flying off into space) and made them into an inseparable team. The Arduino shield design concept has gone way to far. As Sparkfun's massive growth continues office space becomes a premium. Planking is so last year! We're are stacking! You can stack two Spark Fun employee shield's, in order to double throughput. Despite the perceived benefits of the new "engineer" chairs the added productivity is not enough to make up for the productivity lost due to their uncomfortable nature. Not satisfied with workspace densities offered by standard cubicle configurations, Sparkfun engineers take space efficiency to new heights. As an added bonus, low level employees find it difficult to leave work early without tipping off upper management. There's so much more room for programming! and so we went from standing desk to double standing desk..it's just better for your health. Ever since chairs became extinct, life at work became much, much harder. Ummm, the song goes "Put your HEAD on my shoulder..."
Tony Montana does not approve. Sparkfun HQ is like the Galapagos Islands for observing geeks in their natural environment. "pennies make pounds and pounds make profits"
Taking Brogramming to the next level. Is this what is meant by "Agile development"? I heard Sparkfun outgrew their building, but I didn't know it was this bad! Seniority has its perks when space is limited. Finally, the criteria for internal promotions at Sparkfun HQ is revealed - hair length. "Will you PLEASE ANSWER THE PHONE!?"... "Yeah, one second. How about getting off my back, and pass me some tape?".... "There's some on that desk over there. Fetch!" The Sparkfun software design team completely misunderstood the meaning of the term "team stacking." This is how we reward co-workers eating 30 bags of chips while watching Scarface at Sparkfun. Say Hello to my little friend. He used to complain that his boss was "Breathing down his neck". If he'd only known just how bad it could be. Guys, I know we moved the company not that long ago... but anyone else think it might be time to get more office space? Yet another way to run Windows games on top of a Mac. Stack overflow at line 0! new research in parralle programming shows signs that limited office space problems may soon be relieved. Greg misunderstood the portion of his MBA curriculum which advocates organizational hierarchy. He also misread the notion of senior management having an "office with a vaio". THIS is how you code a self balancing robot. Initially, Pair Programming was a great way to bolster company moral. Now, it's just another gimmick to save floor space. If I have coded cleaner, it is by squatting on the shoulders of Brian. I didn't wear green for St. Patrick's Day, so I had to get to higher ground. This vertical integration thing is getting out of hand. I CAN SEE THINGS ARE REALLY STACKED UP! Sparkfun entirely misunderstands the concept of vertical integration. He could never figure out why the basketball was always thrown at HIS head ! And they said that we couldn't put our desks in a higher place in Colorado. Interns are apparently just as comfortable as Aeron chairs and much much cheaper. For better product development we keep the hardware and software guys close, It also helps us see which one is under pressure. MLC with a pair of 2-bit error correctors. The engineering department wants to demonstrate what a package on package device is. or To make room for the larger snack tray, a little vertical integration was necessary. The guys are trying to reduce wasted space so they can keep more food lying around. It has always been a myth that pc users were riding on the shoulders of apple users. Today we bring actual proof that this is true. Expand your limits! First human shield, you only find at sparkfun!! Rob told them they needed to double up to get this project done on time. He didn't count on them taking him this literally. Sparkfun's product idea of a shield to expand your desk's capabilities is deemed a little over the top. Two coders for the price of one: Tables included! Surfing the Internet Issac Newton Style - "If I have seen further it is by standing on the shoulders of giants." "This whole 'suriphobia' thing is getting old." Nate... did you try to anwser a question on Stack Overflow again? With Office space tight, management decided the only thing to do was to get their Mac users to shoulder the burden of their PC counterparts. At Sparkfun it felt like common sense. The desk shield was put to test. Here we see tier two of customer support in action. Leasing office space by the square inch is great for the bottom line. Dude, If you fart, you're going down! MAD: You're both going down. We didn't have the heart to tell them that Cirque du Soleil's Arduino-themed show was cancelled. Introducing Sparkfun's latest invention: Bunk desk! The fun of a bunk bed with the productivity of a desk! Spark Fun does paired programming a little bit differently. In a win for ADA and Sparkfun, the Smith Siamese twins started work on Monday. Designing a Shield Starts with checking out pin layout and compatibility. "Guess what! Rob bought burritos for the office today." "That's coo... uh, DUDE! NOT Cool!!" This early Voltron prototype was a complete disaster. The triple stack never met with the same success as the double stack ! It's not exactly what I expected when they said I'd have a high rise office. The best way to design PoP assemblies! It was a slow day at tech support at Circ de Soleil. Your right there is a better WiFi signal up here! Phil and Tim wanted to do pair programming but had to work around the company policy that employees should primarily work at their own desks. To extend Moore's law indefinitely, we at Sparkfun have perfected 3D IC device fabrication, thus allowing us layer cpu cores for maximum space efficiency. When the work starts piling up, pile up the work! Wouldn't it be LIFO ? The guy on top would be last in, and first out. Sparkfun Brand Canned Geek: Stackable for easy handling and transportation! Due to an incompatibility between Apple and Microsoft in the horizontal plane, engineers using different platforms must be stacked vertically. Bill and Ben, the Colorado conjoined twins never thought they could get a job, until Sparkfun stepped up to the plate ! The software team doesn't quite get the concept of top-down/bottom-up software design. To bad it was a corned beef and cabbage for breakfast this morning there will be a entry level engineering position opening up shortly. Please find above the real meaning of "Management". The famous Zucchini Brothers recently retired from Ringling Brothers circus have taken up new careers as computer geeks working at Sparkfun. The company was more than willing to make special arrangements for their comfort. Shield stacking; no longer just for hardware engineers. SparkFun programmers also moonlight as circus performers. If you were having trouble connecting to the Internet, I don't think this is what they meant by stacking on an Ethernet Shield. At Sparkfun we pride ourselves on how well our production crew is rising to met demands. Introducing the first Human Shield from the makers of Arduino, now available at Sparkfun. Tomorrow I get to be on top. 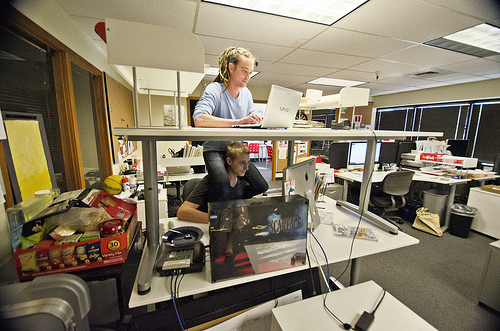 News Flash -- Sparkfun successfully implements extreme desk sharing! At SparkFun, it's not just Arduino shields that get stacked! Are you SURE this is how the stacked IC designers got their start? Due to budget cuts, Sparkfun has implemented a strict "two engineers per chair" policy. all your Double Desker are belong to Sparkfun. testing is now in progress to see if worker stacking can be as effective as shield stacking. Even after everybody has gone, Jeff and Bill still keep at it. Taking Piggy-back riding to a whole new level.